Adobe Premiere Pro is one of the most popular industry standard tools for video editing needs. This program assists users to manipulate different characteristics of videos as well as images and these effects can be adjusted in almost every frame whereas user demands. Those who are beginners may find Premiere Pro little complicated but you can easily find lots of tutorials over internet that provides complete assistance to an initiator. It is good to look at those tutorials first and then start with editing task on Premiere Pro. It will definitely provide you impressive results within very less time. If you are a beginner with editor software and find Premiere Pro too complicated then it is good to start with Wondershare Filmora first due to its user friendly interface. This software tool has so many advanced features hidden inside and they work impressively on Mac as well as Window platform. The very first element that is required by all premiere pro users after its installation is the workspace. It is a collection of tools that can assist you to complete any desired task. On workspace menu that you will find below windows option, tools are generally broken down into so many sections as like Titles, Audio, Color Effects, Editing and Assembly. Once you open the Premiere Pro software program then here you will find two large video windows, they are named as program panel and source panel. In the lower left portion of the screen, project panel resides. As screen layout is broken down into three sections, here you will find 4 frames that can be opened. Two are available on the top on program monitor and source panel whereas two more windows are located at bottom side in timeline and project panel. However, each frame can have any number of panels. Simply grab the texture available on tab and then drag a specific panel to any desired frame on system. Whenever users pick any panel and hit one new frame, they will find a trapezoid of purple color on screen. Release controls when you hit central portion of the new frame and the selected frame will be automatically added to the corresponding tab. Hit any portion of panel and it will help you to divide that frame into two sections. There is a unique feature inside Adobe tools, it is named as panel menu. As soon as you start working over your project, you will be able to explore this panel menu with more controls. It will reflect all available selections for areas where you are working. Few commands are available specifically on panel menu. Now, let us move to the basic process of Adobe Premiere Pro. You can easily find so many videos over internet to get general idea about how to use editing window on Premiere Pro so that clips can be imported with ease and further it can assist users to develop sequences and timeline etc. We always love to access shortcut keys on our computer because they help to make processes much easier and let use move on faster pace. While working on Premiere Pro you will again seek those shortcut controls but the great news is that this editing software allows users to use keyboard shortcuts to make things easier. They can improve your efficiency and will also provide better results without making everything complicated. 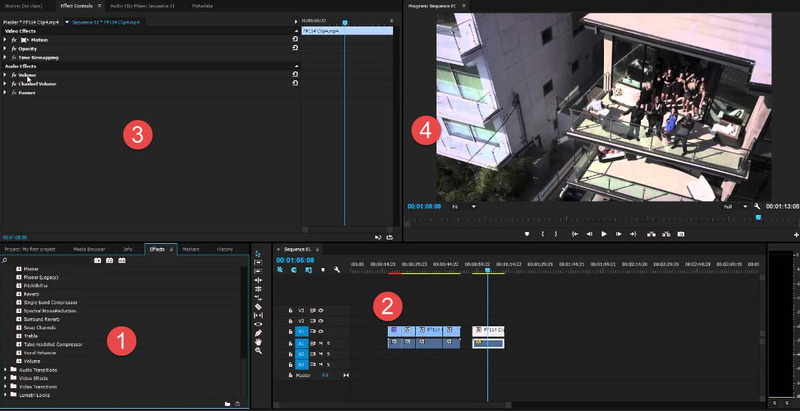 Premiere Pro allows users to handle unlimited effects while editing any video clip. All these effects are designed with customized settings and they provide finer control over editing needs. Prefer to watch some videos online to get better idea about how color correction can be done in Premiere Pro. It can help you to learn the steps to apply various adjustment layers over multiple clips and users can easily develop cinematic appearance with color correction tools for their videos. Audio editing task becomes much easier with Premiere Pro as it possesses so many advanced tools to accomplish this need. You can synchronise audio and video files together using this software tool and further few filters can also be applied to enhance quality of audio signals. It provides assistance for dealing with music tracks on background as well as in voice over needs. Fade in and fade out controls are commonly used. In case if you have collected a footage from certain live event or from your favourite TV show in form of multiple clips then multicam feature of Premiere pro can help you to handle all editing tasks with ease. This multicam feature assists users to switch easily between numbers of video clips on real time basis and the results will be like live productions. Most of the marketing specialists as well as students need to use this feature for videos and audios. Premiere Pro can help you to manage all these needs with ease. One can easily make lower thirds or add basic video titles in latest version of Premiere Pro. It is also possible to generate multiple titles, re-position then and save templates or resize text as per need. Once you are done with the editing needs then it is good to export your video to computer or directly to some external storage device. Premiere Pro also allows users to update their videos directly over YouTube channels.